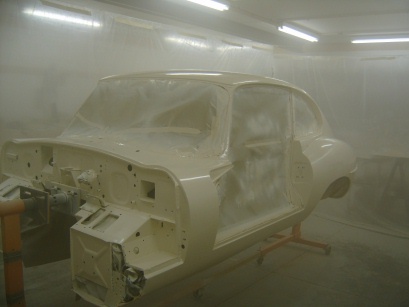 In the last installment of my restoration of an E-type, I had almost completed the preparation of the body shell for the final paint. I had been busy laying on multiple coats of Dupont URO primer-filler. These coats were being carefully block sanded back to a uniform surface. Once I felt that the surface was ready, I began to get ready for application of the final paint. Completion of the surface for final paint can be exasperating. As you go, you will need to continually blow the surface off with compressed air. This has the annoying but necessary effect of blowing out the sanding dust from all cracks, crevice’s, and pinholes. Its amazing how these little defects keep popping up. I have very good lighting in my shop but as I played a handheld light very close to the surface, I found more defects that needed work. 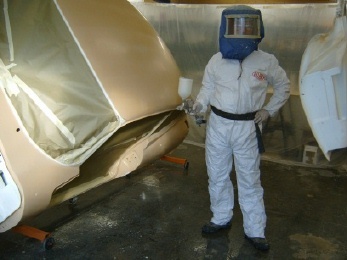 Generally, defects have to be re-coated with glazing putty and/or primer-filler, followed by additional sanding. At some point, switch to wiping down the surface with a prep-wash, which will flush out even more defects. Don’t be fooled into thinking that these small defects can be ignored. 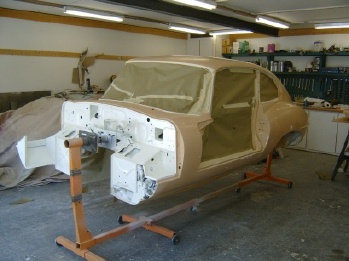 Unlike housepaint, automotive color coats do not hide underlying defects. If anything, they make them look worse. So the prepped surface needs to be absolutely perfect. Here is where your sweat equity can pay large dividends so don’t cut corners. My day for painting the color coat turned out to be a marathon event. I started around 7 o’clock in the morning and didn’t finish until 10 o’clock that night. Here is how events occurred. I had retired the previous day thinking my surface was defect free. Ha! Application of the cleaning prep continued to reveal small pinholes. I think it was lunch time before they were all dealt with. Next I went to work on masking off all areas that didn’t require paint. Buy a good quality masking paper and tape from your supplier. Don’t be tempted to use newspaper, as it may contain paper lint or dust that will wind up in your paint job. Also, before you mask, blow out the interior of the car with your air hose. Even masked off, debris inside the car may wind up on your paint job as you spray. Mask a small distance inboard of the line where the paint will be covered by trim or upholstery. Allocate several hours for masking. It is tedious and must be done correctly. Next I had to prepare my shop as a temporary paint booth. Up to this point my shop had been serving as a sanding pit. Sanding dust coated every surface. I made multiple passes with my air hose blasting the dust towards the exit doors. In particular, blast the ceiling area over the car. The floor can be wet down with a hose prior to painting to help hold down the dust. Next I strung rope in a rough rectangle around the car. Onto each rope I hung plastic sheeting to form the walls of my painting booth. At one end I cut into two simple box fans, feeding through HEPA furnace filters. This filtered air blows into the booth. The air exists in the narrow space between the ropes and the ceiling. I turned on the fans and started moving filtered air into the booth while I did a final solvent cleaning of the surfaces to be painted. The last step is to wipe the surfaces down with a tack cloth, which is a cloth impregnated with a sticky substance that grabs all the dust and such that is left on the surface. Finally, I was ready to shoot some color. For my project, I chose a basecoat/clearcoat system. The basecoat contains the pigments that provide your selected color. The clearcoat goes on last and, as the name implies, is clear when applied. The basecoat is dull in appearance. The clearcoat contains the shine. I used Dupont ChromaBase and ChromaClear products. This stuff is not cheap. It can run into several hundred dollars per gallon. Fortunately, a single gallon may well be sufficient to paint your entire car. Application directions per the manufacturer should be strictly followed. In my case, 2 to 3 coats of base are recommended, with application of each coat separated by a 10 minute flash time. Flash time refers to the action whereby the solvent component of the paint evaporates or flashes off. If you lay the coats on too quickly in succession, the solvents on the underlying coats will be trapped and come out in little volcanic eruptions called solvent pop. Not a sight you want to see! In reality, it took me close to an hour to get the necessary base coats applied. Then the directions specify a minimum waiting time before the clearcoat can be applied. In my case this was about 45 minutes. There is also a maximum time, which is about 24 hours. So the entire process has to occur in succession. If you make a mistake with your basecoat, you have to stop, let it dry thoroughly, sand out the error, and start over. Fortunately, I found that the basecoat applied without much drama. One issue is bugs. They seem to be attracted to the fumes. Keep a pair of tweezers handy to pluck them out. I found that minor imperfections in the basecoat were disguised by the subsequent application of the clearcoat. This probably is not true for high impact colors like metallics and pearls. That’s why I chose a forgiving color in Old English White. Next came the application of the clear. You have to develop a pattern or routine in the application of the clear because it is easy to loose track of where you have been. I was very nervous about runs and applied the clear in multiple thin coats. As we will see, that did not work out to the best, although I did avoid runs. I laid down about 4 coats of clear and called it quits for the night. A quick inspection the next morning before I had to leave town on business revealed a pretty good looking job but a fair amount of orange peel. Look at the surface of an orange and you will see where the name comes from. It is a granular appearance to the painted surface. I see it is lots of paint jobs on new cars so it’s not uncommon. But for an extra nice paint job, there are ways that the hobbyist painter can deal with this effect. Next month we’ll talk about getting rid of orange peel and obtaining a deep, high gloss finish.